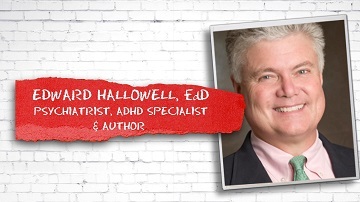 - And now I'd like to introduce Ned Hallowell, who have the most popular videos on ADHD on our site. Thank you so much for taking your time out of your busy schedule to call in with us. So, why is it so important to get your child diagnosed? - When you get the right kind of help, when you strengthen those brakes, then they sky's the limit. I mean, the current CEO of AOL, Tim Armstrong, has big time ADD, and he's very proud of it. He walks around their offices in Manhattan saying, "Watch out for me, I'm having an ADD day." And by that, he means a really good day, he's coming up with lots of ideas. The man who founded JetBlue Airlines has it, and he says it's the key to his success. So, if you manage it properly, it's a wonderful thing to have, and really, most entrepreneurs have it. So, what people need to understand, take it seriously, 'cause if you don't, it can ruin your life, but if you get the right kind of help, it can take you to the very top. You can be supremely successful, happy, fulfilled, and most people don't understand that. Even the term itself, attention deficit, hyperactivity disorder, it's horrible. What a terrible name. I mean, we should rename it the entrepreneur's trait, or creative person syndrome or something like that, not a deficit, hyperactivity disorder. I have it, myself. I also have dyslexia, and I wouldn't trade it for the world. I think people who don't have it have attention surplus disorder. - What do you say to people who are very critical against medication? - People ask me, "Do you believe in Ritalin?" And I say, "It's not a religious principle." It's not a matter of believing in it, it's a matter of science. If it's helpful and causes no side effects, great, use it. If it's not helpful or it causes side effects, then don't use it. What could be simpler than that? And, unfortunately, it gets turned into a hot button issue with all sorts of debates that really don't need to happen. People get scared away by wrong information that's published and don't get the benefits from the medication that they could get, or, on the other hand, some people take it improperly and suffer side effects that they shouldn't suffer. - And for some people it can be like eyeglasses, right? - Absolutely. When it works, it is like eyeglasses. It is as life-changing as getting near-sighted diagnosed and treated with eyeglasses. It's dramatic, effective, safe, and altogether life-changing. - Out here we have two very competitive schools, and a lot of people are critical. They say that half the school is on Ritalin or different drugs. Do you think that it also is over-prescribed, or you think that that's- - Sure, there are places where it's over-prescribed, and there are places where it's under-prescribed, and the goal is for it to be properly prescribed. There are places where people wanna use it as a performance-enhancing drug, there are places where the doctor quote/unquote doesn't believe in it. This shouldn't happen. It should be science. We should prescribe it when it's indicated, not prescribe it when it isn't. The question of over-prescription and under-prescription always comes back to education. - There is a lot of talk, too, about that ADHD's not being diagnosed enough with minorities, people who don't have English as a first language, and people who maybe come from a lower socioeconomic background. Do you think that that's the case, and what can be done to get those kids to support their need? - Sure, and once again, you hear the opposite argument. Some people say in minority populations it's being over-diagnosed as a means of controlling them. I think you have to take it neighborhood-by-neighborhood, and it really matters, who are the doctors there, what is the health care system there? And the solution, as always, is training. There aren't that many doctors who are very well trained. Peter Jensen is leading a national effort to try to educate pediatricians, because they're doing the bulk of the work regarding the proper diagnosis and treatment of ADHD. We really need to do that do that people will get the right help, but it's such a good-news story when you do get that right help, and that's what people need to understand. This diagnosis is good news, because the worst is over. Once you get the diagnosis, assuming that it's done properly, the worst is over. Until you get diagnosed and treated, you're driving on square wheels. And when you suddenly get a set of round wheels, life becomes a lot easier. - Thanks for tuning in, and over and out from Kids in the House.